If you or your loved one experienced serious health problems or even death that may be the result of Xarelto, we can help you understand and seek compensation for the hardships caused by the financial strain of medical care, missed work, even funeral costs and the emotional strain of dealing with these issues. The primary purpose of Xarelto (generic name: Rivaroxaban) is what is medically called an anticoagulant or more commonly referred to as a blood thinner, which is used in order to prevent blood clotting or reduce the risk of clotting in the lungs or veins after an operation (e.g. hip or knee replacement surgery). Manufacture/FDA Approval: After development and manufacture by Johnson & Johnson, a subsidiary of Janssen Pharmaceuticals, and Bayer AG, the drug received initial FDA approval in July 2011. The typical dosage of Xarelto consists of a once daily pill. This same drug was later approved in November 2011 to reduce stroke risk in patients who have atrial fibrillation (causes blood to pool in a storage chamber of the heart where it can clot and travel to the brain). And, in 2012, Xarelto was approved for the general treatment of pulmonary embolism (PE) and deep vein thrombosis (DVT). Deep vein thrombosis is a condition in which a blood clot (thrombus) forms in the deep veins of the legs, pelvis, or arms. Tenderness, pain, or swelling are symptomatic of deep vein thrombosis, though there may be no symptoms at all. A clot from deep vein thrombosis can then travel through the bloodstream to the lung and cause the sudden blockage of a major blood vessel inside the lung. This is called a pulmonary embolism and can be deadly. Surprisingly, Xarelto’s most common negative side effect is serious blood-clot related injuries – the very events it is intended to prevent. According to the first quarter 2012 report released by the Institute of Safe Medication Practices (ISMP) Monitoring FDA MedWatch Reports, pulmonary, venous, and other forms of thromboembolism were the predominant serious adverse events reported, accounting for 158 cases in the first quarter of 2012, for Xarelto. The report states “[t]he unexpected result was that — unlike other anticoagulants (warfarin, dabigatran, and enoxaparin) — the primary reported event was not the well-understood risk of hemorrhage. Instead, the largest identifiable category was serious blood-clot-related injury-most frequently pulmonary embolism-the very events Xarelto is intended to prevent. Though intended to help with blood-clots, Xarelto can cause excess bleeding resulting in serious injuries – this is usually in urine, though may be concentrated in black stools or rectal bleeding; result in coughing/vomiting up blood; intestinal bleeding or brain hemorrhaging; swollen arms or legs; and may even cause death by uncontrolled bleeding. Xarelto was developed as part of what’s been deemed the pharmaceutical “race to replace Warfarin.” Warfarin was a widely prescribed anticoagulant first approved in 1956. It had numerous interactions with other drugs and required monitoring with frequent blood tests. Compared to one of its primary rivals, dabigatran, which had hemorrhages resulting in a median age of 88, Xarelto impacts a median age of 66. Though easier to use than Warfarin because Xarelto did not come with the same level of blood testing or dietary/lifestyle changes, this has come at the cost of patient safety. While the effects of Warfarin could be reversed or reduced with Vitamin K, Xarelto has no antidote to neutralize internal bleeding. In fact, manufacturers have not released any information to doctors about how to treat the bleeding caused by Xarelto. Reports show that women have suffered injuries even months after receiving a prescription for Xarelto. Yet, doctors are encouraged to recommend this drug to women who are pregnant, planning to conceive, or breastfeeding. Warfarin required close monitoring and regular blood tests as well as dietary and lifestyle changers; however many doctors failed to test patient’s kidney function before prescribing Xarelto even though 2/3rds of the drug is eliminated by the kidneys. This means that a patient with poor or limited kidney function cannot properly dissolve the drug and may absorb too much into the body. Manufacturers should be held accountable for this drug that not only fails to live up to expectations, but reportedly causes the very type of harmful clotting it is intended to prevent and puts the safety of patients at risk of serious issues with bleeding. 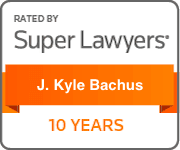 At Bachus & Schanker, LLC Our Passion is Justice. Our firm was founded on the belief that personal injury victims deserve the same level and quality of legal representation afforded by the wealthy corporations on the other side of their claims. We protect the rights of innocent people injured by defective products and marginalized by big business interests that protect the manufactures of those products. Bachus & Schanker, LLC has represented thousands of clients from across the country. We fought to achieve justice for them. We’ll fight to achieve justice for you. Currently, our firm is providing free consultations to Xarelto users and their families who have been affected by blood clots and bleeding issues with Xarelto. To speak with a Xarelto attorney and safeguard your rights: Call us today at 866.277.6711!